With some rain and warmer weather, things in the garden are growing like crazy. Especially that pesky Swiss Chard! We harvested two bunches today, and didn’t really make a dent in it. We also harvested a lot of lettuce, on the theory that if it gets hot this week, the lettuce may start getting bitter. That’s a lot of leafy greens! (Not all of it is Family of 4 Garden, so we didn’t weigh all of it.) 2 bunches of chard, and at least4 pounds of lettuce. There’s our two bunches of Swiss Chard. The colors aren’t all as dark as they will be later in the year, but still very beautiful. I must be making converts to the chard, because it all got taken home today! 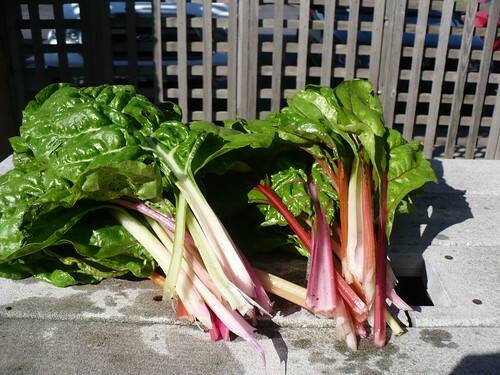 I do have a recipe in my head for chard that I want to try out at some point. Chard, mushrooms, bacon, garlic, maybe some cream – it has to be good with all that on it, doesn’t it? 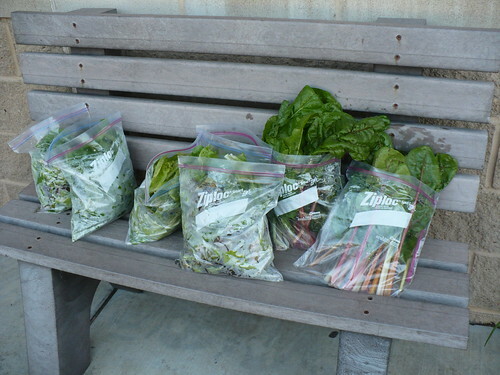 Posted on May 31, 2011, in Family of 4 Garden, Harvesting & Eating and tagged chard, harvest, salad greens. Bookmark the permalink. Leave a comment.